Grundfos and Techno Creatives partnered together to create an interactive world that allowed visitors at the Future Lab to learn more about the various opportunities connected pumps and data had to offer when it comes to tackling some of the world’s toughest problems. A massive touch-screen was used as the point of interaction that ensured multiple visitors could share in the experience at the same time. A 3D city, complete with its own financial district, downtown area, quiet suburbs, farmland and it’s very own island was designed as the platform where all these water stories would unfold. The city was a true interactive storytelling experience that immersed visitors into a virtual world where exploration was key and inspiration was just a tap away. 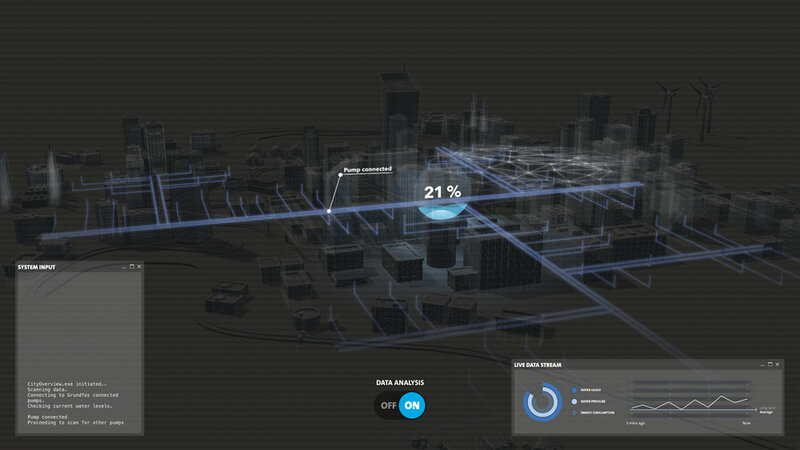 Every tap revealing a thought provoking idea for the future and how connectivity, data and water will act as enablers, all of it visualised for the guest to experience directly on the city. Swipe around and discover what projects Grundfos has been working on to fight some of the earth’s water and climate challenges. The objective of showcasing these stories was to trigger ideas and collaborations between Grundfos and their various customers to lead the way into the future. The future of data will tell us many stories and the Grundfos Connected World gave the Future Lab its storybook. The Connected World was launched in December 2017 and will continue to grow and evolve as new, fresh ideas and partnerships blossom as a result of this immersive experience.